At AJKD’s recent editorial board meeting in Atlanta, board members heard about the journal’s performance over the past 12 months. While we like to keep board members up to date on AJKD, our prime concern is serving readers and authors, so thought we’d share a few highlights of the presentation with the AJKD community. Our theme this year was comparing 2013 with a decade ago. It turns out there have been some pretty noticeable changes not only in appearance (check out AJKD’s ‘bronze age’), but also in type of content. Back in the day, ¾ of articles were studies and reports, while today, they make up less than 50%. That’s been a deliberate choice, because it makes room for a wide variety of reviews, teaching cases, and commentary. Educational features tend to levy an impact factor hit because they aren’t often cited, but there’s evidence that they’re highly used (we consistently see such content among our most-downloaded articles). For that reason, we think they’re important part of our mission to help physicians provide patients with the highest standard of care (by the way, AJKD’s ever-popular Quiz Pages and Core Curricula were freely available then, and are still freely available now). Over the past decade, as the journal has doubled the number of features it publishes, it’s also been focusing on delivering rigorous, important clinical research to readers. The acceptance rate for Original Investigations is about half what it was 10 years ago, statistical review has become an integral part of the consideration process, and authors are asked to follow best practices for reporting studies (including structured abstracts). Granted, these changes bring additional burdens to authors and editors, but the records show that the median time to first decision after peer review for Original Investigations is just a few hours longer now than it was 10 years ago. While we’re all about rigorous review, we understand that clinician-researchers are busier than ever, so over the years we have reduced the number of manuscripts we send out for peer review. This gives authors of papers which aren’t a good fit for AJKD a quicker answer, and helps lighten the burden on the reviewer pool. Total reviews performed for AJKD have dropped by over a third, even in the face of a 44% increase in the number of submissions. And, in 2013, nearly 2/3 of reviews were returned on time (thanks everyone! ), versus less than half in 2003. How do our authors feel about all this? 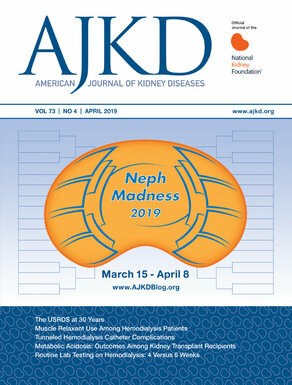 The latest author survey shows that, compared to average scores of competitor journals, AJKD comes out significantly better in terms of reputation, impact factor, and readership. Refereeing speed is in line with our peers, but production speed also gets top marks. Best of all, 100% of surveyed authors say that they will submit articles to AJKD again. 1. In condescending the material, please remove Table 1. 2. I’ll go through it in dental and will draft the letter. 3. I enjoyed this article. It has excellent education al value. Copy-edittig is needed. 4. Sorry for the delay, I was struck in a meeting. 5. CKD is a major pubic health issue. 6. In the phrase “primary care office”, office should be pleural. 7. Please shorten the manuscript to the requested world limit. 8. Have you created a graft revision letter for this yet? 9. You should do a spell heck of the document. 10. In measurements, indicate the assy methods used.